There’s a sense of freedom that comes from being on the water, whether you’re savoring steaming mugs of coffee on a cool morning, preparing snacks on a daylong adventure filled with swimming, water toys and fun, or simply cruising along the shoreline, scouting for wildlife or admiring the lake homes. The Cabana 240 gives you everything you need to bring these shimmering visions to life. 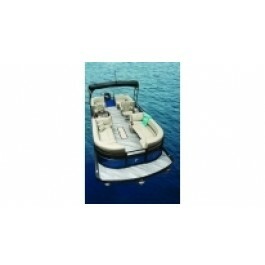 Not only is this 24-foot pontoon boat easy to manage, with gentle manners, reliable performance and predictable handling, it can accommodate up to 200 HP on two pontoons and up to 300 HP on three pontoon tubes. It also has a variety of floorplans to choose from. The CW floorplan will delight cruisers, who will revel in the spacious lounges and comfortable lounges. Add to that the large Bimini top and changing room, with available options such as a double Bimini or Sport Bimini, shore charger and soft-sided cooler, and you have everything you need for the 240 to become a customized, well-loved, stress-free home away from home.